Thanks to all of our friends, we’re having a very good year. 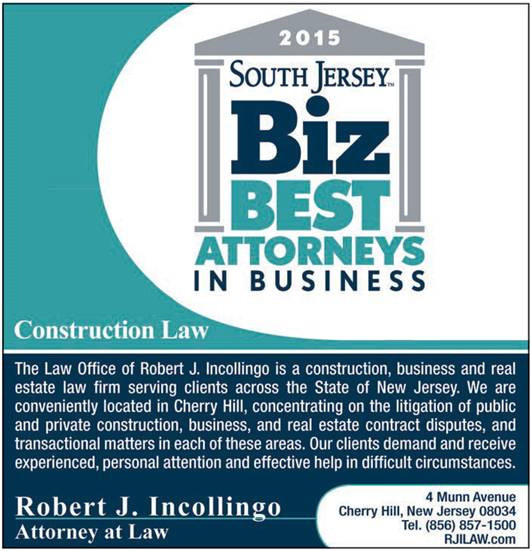 The Law Office of Robert J. Incollingo has been selected as one of the Best Attorneys in Business 2015, by SJ Biz Magazine, in the category of Construction Law. The Best Attorneys in Business list is issued by SJ Biz Magazine. A description of the selection methodology can be found at http://southjerseybiz.net/articles/?articleid=1061. No aspect of this advertisement has been approved by the Supreme Court of New Jersey.